The FLIR C3 is for pros who want a pocket size thermal camera they can use for day-to-day inspection sat jobsites. If you are looking for a powerful thermal camera for in-depth inspections, this is not it. It is less capable than a $1,000+ thermal camera. But for everyday situations such as quick structural inspections, HVAC maintenance and electrical repair, it’s great. For the price, the FLIR C3 comes with an impressively long list of helpful features. 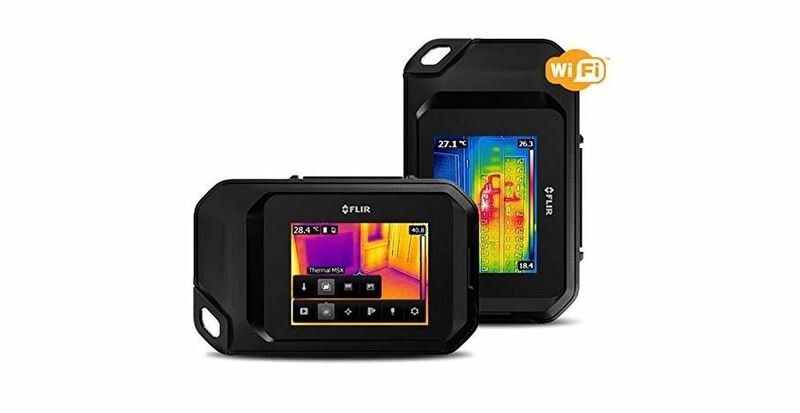 It has a powerful thermal sensor with a wide temperature range, abright3” touch screen and WiFi connectivity. It also comes with FLIR’s proprietary MSX technology that combines visual and thermal details for more detail. Other pro tools include a temperature scale and a spotmeter. 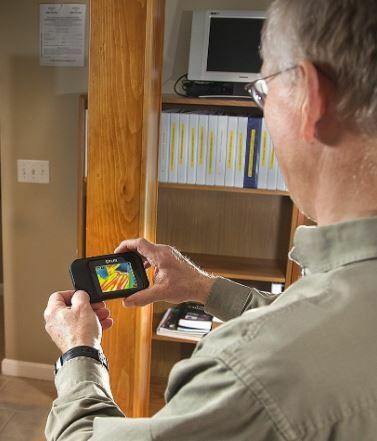 Amateurs and hobbyists will find the FLIR C3 equally handy for basic home inspections such as checking insulation and moisture detection. 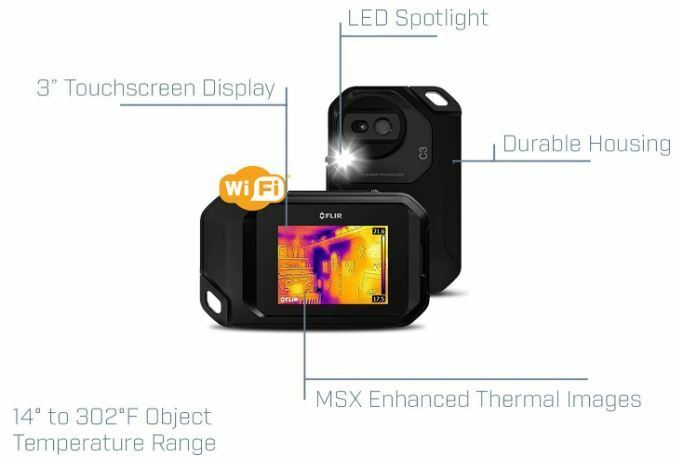 Keep reading to learn more about the FLIR C3 pocket thermal camera. If this is not what you were looking for, check our reviews of other cheap thermal cameras for sale. A large and powerful thermal camera is essential for certain situations where rigorous and in-depth inspections are required. But for regular inspections, a compact camera like the C3 is a much more practical choice. It easily fits in your pocket, meaning you can easily carry it with you anywhere. The C3 is not waterproof but it can withstand a few falls and dirt hands without any problem thanks to its rugged and hardy construction. Small and affordable doesn’t mean you have to settle for low quality thermal images. The FLIR C3 features an 80 x 60IR sensor that can detect a temperature range between 14°F to 302°F. This is not quite powerful enough for some industrial applications; but for most types of inspections such as HVAC, insulation and electrical systems, it’s great. Because of the sensor’s limited distance range, it’s best for close-up inspections. We do not recommend it for hunting, long-range exterior inspections, security or ghost hunting. The sensor has a temperature sensitivity of less than 0.10°C, meaning it can accurately spot the smallest thermal differences on an area. This is important for sensitive system inspections. The 41-degree field of view lets you inspect a large area at a time. The camera displays images on a brilliant 3” display. It is a touchscreen display, which makes it super easy to navigate through the camera’s interface and select your preferred settings. With three levels of brightness, the display works great in all light levels whether you are outside in the sun or in a dark basement. This is one of the best features of the FLIR C3. The C3 has two cameras: an IR camera to capture thermal images and a normal visual camera. When you snap a photo, both cameras spring into action. The integrated software then integrates the visual details into the thermal image so that you know exactly what you are looking at. If you are in a dark place, you can use the flash to get a good visual image (the flash also works as a flashlight). For those times you don’t need an image overlay, you can switch to a thermal-only or visual-only mode. There are two ways to transfer your images to another device. The easiest is using WiFi. It’s handy when you need to share images instantly with team members. To transfer a large number of images, connect the camera to your computer using the included USB cable. It will be faster than WiFi. Once you’ve transferred the images, you can analyze them and create professional reports using the free FLIR Tools software. 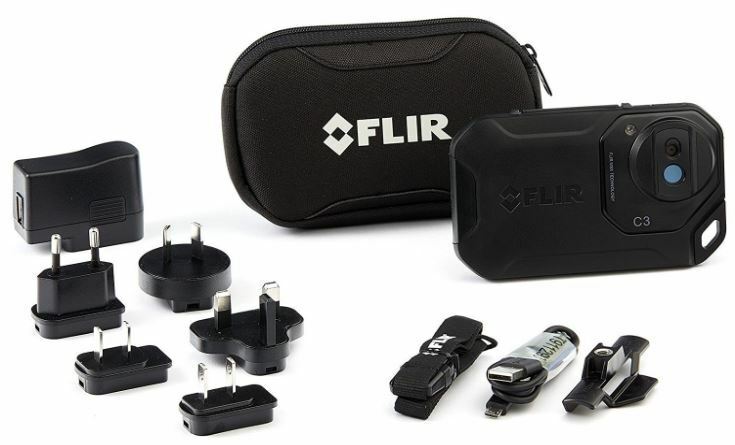 Note: FLIR also sells a cheaper non-WiFi version of the C3 thermal camera – the FLIR C2. Here are some of the settings and options available in the camera’s interface. Measurement Parameters: You can configure reflected temperature, distance and emissivity. Save Options: Let’s you save the visual image as a separate JPEG file. Device Settings: These include time, language, temperature & distance units, orientation, display brightness and auto power off. Lock Mode: In normal operation, the camera might display different colors for the same temperature when you move from one scene to another. This is a problem if you want to compare two objects or areas. Lock mode allows you to lock the temperature range to a specific color representation. If a certain temperature shows up in white in one scene, it will also show up in white in another scene. Color palette: You can change the color scheme the camera uses to display temperatures. Options include Rainbow, Iron, Rainbow HC and Gray. The camera is best for close-up applications. If you were hoping to use this camera for hunting or security, it won’t be very helpful. The camera’s internal memory can hold up to 500 images. If you want to more space, you have to delete some images or transfer them to your computer. You cannot expand memory with an SD Card. But with both WiFi and USB transfer options available, I don’t think the lack of an SD card slot will be a deal breaker for most users. 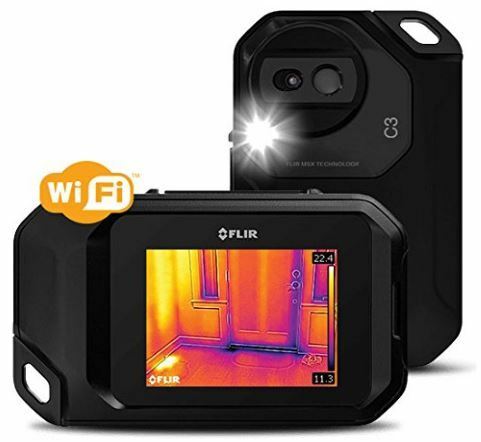 If you are looking for an affordable thermal camera that is powerful enough to meet most of your inspection needs but small enough to carry in your pocket, the FLIR C3 fits the bill.